Any top killers that will kill crabgrass will burn the lawn grasses as well, which tends to leave the lawn with temporary dead spots, that can look even worse than the lawn with crabgrass. The good thing about crabgrass is that it will die when we get cold weather in October. The bad part is that it can produce a lot of seeds for next year. This year - Hand-pull as much as possible. Make sure mowing height is at least 3" high. Crabgrass likes warm soil temperatures. The extra blade length provides a little more shade to keep the soil cooler. Going from a 2" mowing height to a 3" mowing height may not seem like much, but that extra 1" is 50% more grass blade. The extra shade also reduces water evaporation, reduces the chance of chinch bug problems and helps reduce weed germination. 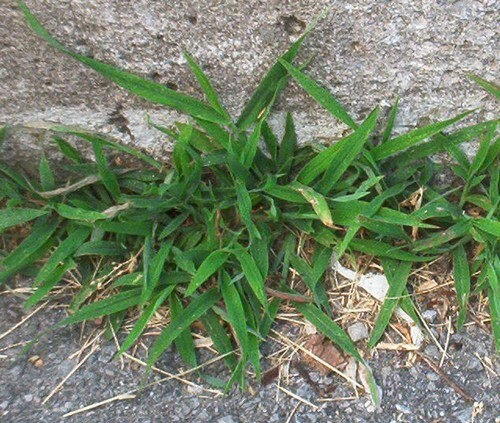 Crabgrass tends to grow in the weaker and warm areas. The warm areas are alongside pavement and patios where the hard surface transfers heat to the adjacent soil. Make sure when trimming that the lawn along the edges is not trimmed too short. Weak and thin areas - Thin areas allow the soil to get warm enough to allow crabgrass to get a foothold. When the lawn is thicker, there will be less crabgrass. Fall is a good time to thicken your lawn with overseeding. Mid-August through September is the ideal time to increase density of lawns. The night temperatures are cooler and water does not evaporate as quickly. This is Mother Nature's grass seeding season (and when the sod farmers do their seeding, too.) Spring seeding is second best, but seeding at that time of year can be tricky if you put on the crabgrass preventer as it can interfere with grass seed germination. Of course, regular and professional applications of a high quality granular fertilizer three or four times per season help to increase tillering in Kentucky bluegrass, a fancy way to say it increases density and thickness.